Nowadays a large amount of subjective information is generated through social networks such as Facebook® and Twitter®. However, analyze manually this information require effort and time. Therefore, multiple sentiment analysis approaches are being proposed as a solution to this problem. Sentiment analysis is the field that studies opinions, feelings, sentiments, and attitudes that people express towards different topics of interest. 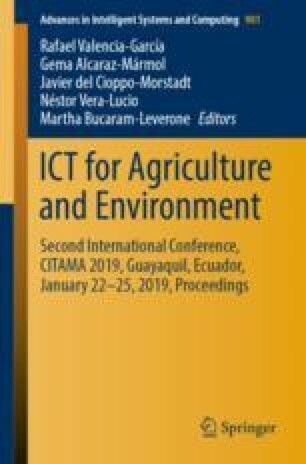 Agriculture domain implies a large area of opportunity to obtain benefits using sentiment analysis, such as obtaining information about insects that affect sugarcane, rice, soya, and cacao crops, chemical substances used in crop diseases control and management, symptoms, recommendations, treatment, among others. However, agriculture domain has been very little studied. In this sense, we propose a sentiment analysis approach for agriculture to obtain the polarity at the comment and entity levels from texts. Finally, we assess the performance of our system under precision, recall, and F-measure metrics, obtaining average values of 77.43%, 77.50% and 77.35%, respectively.